As I have mentioned before when it comes to helping others im all about it. I know this really isn’t about food but its for an amazing cause. On Sunday, November 17, 2013 at 5 p.m., the highly anticipated 5th Annual Joseph Anthony Style Wars fashion competition benefiting children’s cancer foundation, Adopt a Pig: Change Matters for Kids with Cancer, a 501 (c)(3) public charity and 100% volunteer organization will take place at The Ritz-Carlton, Philadelphia. 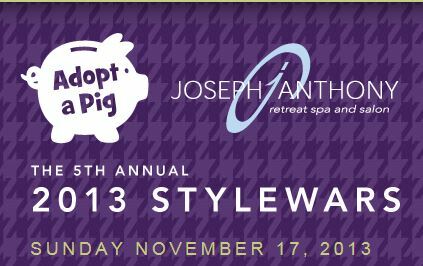 One hundred percent (100%) of funds raised through sponsorships, ticket sales, Porsche raffle, and LIVE auction at Style Wars 2013 will directly benefit the Adopt a Pig program. The initiative began in April 2005 when a father and daughter painted their first piggy bank shortly after learning of her caner diagnosis. The project was initially a distraction for their family, but later transformed into a source of therapy. Now, thousands of piggy banks are an important coping mechanism and lead the fundraising for the charity. They are sold (“adopted”) for $25.00 and proceeds benefit a variety of support services and coping mechanisms for patients and their families. Learn more about the charity at www.adoptapig.org. Sunday’s event will be hosted by FOX29 Good Day co-host, Jennaphr Frederick and will feature a special performance by Jade Starling lead singer of 1987 hit, “Catch me I’m Falling.” Guests will enjoy complimentary gourmet hors d’oeuvres and an open bar from The Ritz-Carlton Philadelphia. The highlight of the night will be when teams of stylist from Joseph Anthony and models from MMA Model Management Agency compete for the best overall look—hair, makeup, and wardrobe on the runway. Saks Fifth Avenue Bala Cynwyd, who hosted a star-studded pre-party for the event on September 23rd, will be providing the looks during the runway show. For the first-time in Style Wars history, Style Wars will be raffling away a two-year lease to a 2014 Porsche Boxster from event sponsor, Porsche of The Main Line and Maserati of The Main Line. The Porsche Boxster will be showcased aside other luxury cars from McLaren of The Main Line at the event. (Ticket information below). The competition will be judged by the area’s top authorities on styling including fashion illustrator & style expert, Dallas Shaw, Jimmy Contreras aka JimmyStyle from PhillyStreetStyle.com, celebrity stylist, Jen Abrams, and Joseph Mastalia, President of DePasquale Companies. Additional key sponsors include: The Hughes Center at Joseph Anthony, Nemours/Alfred I. duPont Hosptial for Children, Jeff Kellmer Private Jeweler, Jim Cottingham Photography, Despasquale Salon Systems, DJ Dan Cronin, Zarwin Baum DaVita Kaplan Schaer Toddy, P.C., Main Line Today, Fleming’s Prime Steakhouse & Wine Bar Radnor, Rubinstein’s Office Supplies & Furniture West Chester, The Drew A. Katz Foundation, FOX29, Jennaphr Frederick, Willow of Haverford Square, Aqua America Inc., Closets by Design of South Eastern Pennsylvania and Delaware, UBER, Harvest Seasonal Grill & Wine Bar, Avenue Kitchen, NINO Brand, Tony Luke’s Cheesesteaks, Deneen Marcel Lashes. TO PURCHASE TICKETS go to, www.jastylewars.com or you can visit Joseph Anthony Retreat Spa & Salon in Glen Mills. VIP tickets are $175.00 and include complimentary hors d’oeuvres, open bar, and gift bag. Porsche raffle tickets are $100.00. (Porsche raffle details: 2-year lease. 1-500 chance of winning. Winner need not to be present at Style Wars 2013 to win. Winner will be chosen at random. Color of vehicle may vary. Car color featured is Agate Grey for promotional purposes only. Vehicle is PDK (automatic). Porsche of the Main Line cannot guarantee that exact color or this exact vehicle in stock by the time of the event. *10,000 miles/year, winner pays applicable taxes, licensing and deliver (if applicable) fees.) *Special Style Wars week only promo: Buy two event tickets, receive complimentary Porsche raffle ticket.